Updated: Dec. 2, 2017, 1 a.m. The key to learning, perhaps, lies in our willingness to try. Clara Stephens has proven her willingness. And her faith. She said it’s now time to take the lessons learned and move forward. In January, Stephens opened the Women for Christ International Foundation Inc., a nonprofit counseling practice and thrift store on E.E. Butler Parkway in Gainesville. Women for Christ International Foundation, Inc.
Like any new endeavor, Stephens experienced some ups and downs. In time, she decided to close the thrift store, where she had helped dress men and women for success. The clothing bank also served the homeless and aided victims of domestic violence while providing funds for business networking, financial literacy and computer training courses. But if she had never opened in the first place, today might not have come. Having the retail location allowed Stephens to make her name known in the community, develop supporters and additional resources among local nonprofits and civic organizations and serve those in need. And she said that’s just the tip of the iceberg when it comes to what she’s learned over the past year. “If I begin to list them, we will be here all day,” she said with a laugh. Stephens has now moved her practice into a suite at the North Georgia Community Foundation on Oak Street in Gainesville. She provides marriage counseling, support meetings for family members managing addiction among loved ones, as well as pastoral care with prayer and Bible study groups. “That continues here,” Stephens said of her mentorship programs. In fact, Stephens is confident she and her clients can benefit from the available conference rooms as well as the built-in connections the other in-house nonprofits provide. “It makes me feel much more comfortable and secure,” Stephens said about having like-minded individuals and charitable organizations in the same building. Stephens has a varied background. 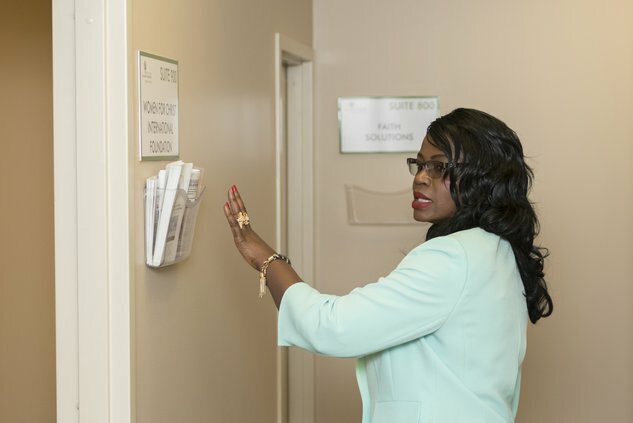 An immigrant from Nigeria, she has worked as a chaplain at Northeast Georgia Medical Center in Gainesville and Braselton, raised a family and published two books recounting her travels and travails. The Foundation building feels like a second home now to Stephens. Her husband, who provides life coaching and family counseling, even works in a suite next to hers. “I couldn’t have asked for more,” she said.